It’s easy to see why pansies are one of the most-loved flowering garden plants. They provide hassle-free colour to garden beds and are the earliest flowering plants after spring bulbs. They’re not fussy at all, but if you give them a little extra attention, they will reward you with spectacular spring flowers, which may last well into the summer months. Pansies are vibrantly-coloured flowers with a velvet texture that consist of five round petals and vary between one to three colours. They are 5–8cm in diameter and can grow as tall as 23cm. Pansies can be seen as both perennial or annual, but are generally regarded as annuals by gardeners since their stems become spindly in the heat of summer. They perform best when grown in bright light and cool temperatures. They can be watered 1–3 times a week, if the soil becomes dry. Water the soil instead of the leaves. Avoid overwatering as this could cause the roots to rot. Plant in fertile, well-draining soil. Add a generous amount of compost and bonemeal before planting. Feed your pansy seedlings with a balanced liquid fertiliser once every 2 weeks. To keep your pansies blooming for as long as possible, deadhead them by cutting off any drooping or infected blooms. Cut away stems when they become spindly in summer to prevent them from dying. 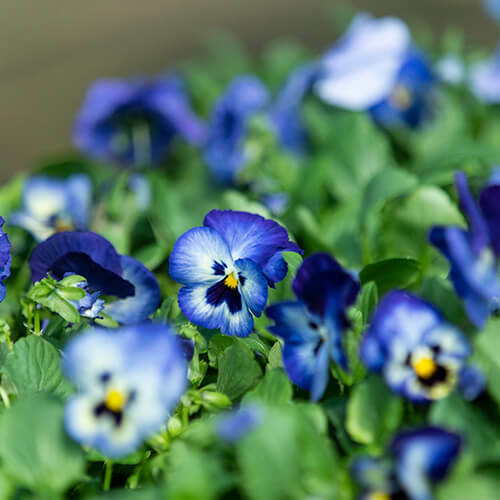 Plant pansies with companions such as snapdragons and petunias that are slightly taller and grow in similar conditions to create a beautiful backdrop in your garden.